We have been issuing a series of bulletins in recent months on Brexit ‘no deal’ news as it comes in. The news has also been posted on our website. Just to remind you: a composite notice for the impact on the chemicals producing and consuming industries has been issued and can be found here. 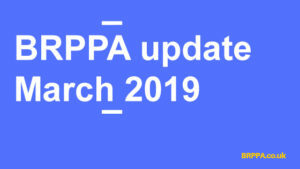 BRPPA also organised a lively and informative briefing by officials from the Department of Business, Energy and Industrial Strategy (BEIS) and DEFRA at the meetings of the two BRPPA Groups on 12 March. This followed a similar event in October. The major area of concern on Brexit is over the future of the chemicals regulatory regime that will apply when the UK leaves the EU. Thérèse Coffey MP, Parliamentary Under Secretary of State for the Environment, has confirmed the Government’s plans to transpose the REACH legislation lock, stock, and barrel into UK law in the event of a No Deal Brexit. In the meantime a commitment for Britain and the EU to explore the possibility of “cooperation” between UK authorities and the European Chemicals Agency has been included in the Brexit political declaration. The chemical and allied industries feel that these proposals are unworkable and unsustainable. They rely on the unrealistic assumption that UK companies have ready access to testing data; they will almost certainly increase animal testing; and will impose an unsustainable additional regulatory cost on UK companies. Above all, the Government’s proposals assume that a UK version of REACH can be achieved in just two years – a regime that took the EU and a fully-resourced European Chemicals Agency ten years to implement. The decisions, taken separately in both organisations, will enable UK industry and other stakeholders to continue their important work shaping and maintaining best practice standards used across Europe and internationally. They also mean that UK experts will continue as chairs, convenors, committee members and policy experts to work on maintaining and developing the 20,000 European standards that are managed by CEN and CENELEC. Standards users in the UK can continue to be confident that these standards will meet their needs as they will be influenced, as now, by UK stakeholders.